Alison from Little Bunny Quilts chose the Sparkle collection by Amanda Murphy and stitched a festive tree skirt ringed with star blocks. Hello! 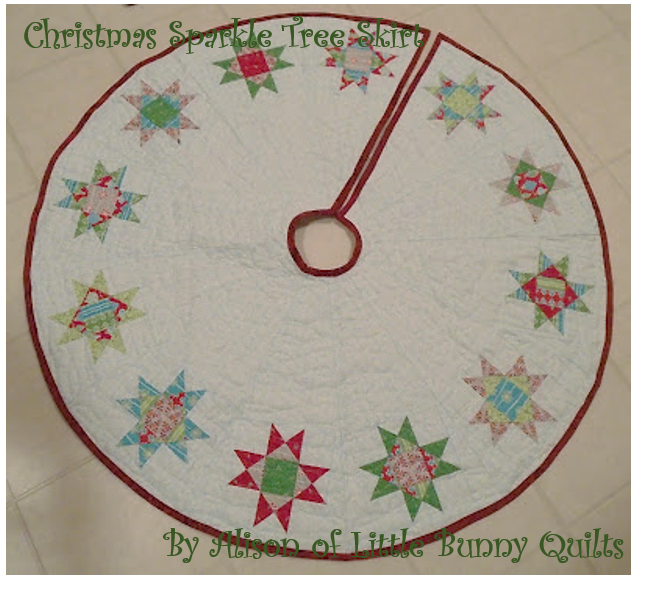 I'm Alison from Little Bunny Quilts and I'm sharing a fun tutorial for a tree skirt using Amanda Murphy's Sparkle line! Let's get started! Thanks for letting me share this tutorial with you today and don't forget to stop by Little Bunny Quilts for your chance to win! Thanks, Alison! Head over to Alison's blog to enter for a chance to win a FQ bundle of Sparkle fabric! Thank you for this tutorial. I am still using a white sheet for my tree skirt. I have been sewing for Christmas since June, place mats, mug rugs, runners, and quilts. I think I need to make a tree skirt for myself. Absolutely gorgeous. Thank you for the tutorial. Total #CreativeGoodness. This is just fantastic.Great tutorial!! I love the fabrics, I'm a fan of the Ohio Star block, and the tutorial is great. I have a skirt for my large cut tree but minus the slit and cutout this smaller skirt would be a perfect topper for the round side table that holds an iron tree and blown glass ornaments too heavy for the cut tree. Thanks for the info! This is a beautiful tree skirt and with a fabulous tutorial! I believe my store bought tree skirt will be replaced this year with this new one. Thank you for sharing and have a fantastic creative day! Love this tree skirt! I will definitely have to make one of these! Definitely would make a nice table topper, or with a smaller hole, a table top tree skirt/table topper. The tree skirt is so beautiful with that red binding. Thanks for a great idea. Love the tree skirt. Who would like this around their tree! Love it! Sew pretty and sew easy!! I have a pre-quilted panel that I bound for our tree skirt many many years ago. I've made others as gifts, maybe it is time to update. I follow Little Bunny on bloglovin. FOr thirty years, I have been pulling an old sheet out of the closet and putting it around the base of the tree. Every year I say "I really need to make something for ME. Like a tree skirt!" This is so quick and easy! Love it! Love the tree skirt tutorial. Great choice of fabrics. Sure would love to win the fabric.